What is the current speed of the parker probe which is just launched today(After Final boost(detached by the rocket)). I was just guessing as it will attain max speed of 194 Km/sec, that's why does the velocity of the probe mainly comes due to this boost or it will be mainly because of the gravity assists? I added this to a special page to Where is Roadster, you can find the Parker Solar Probe info here. The current location is 7,338,815 miles (11,810,682 km, 0.079 AU) from Earth, moving away from Earth at a speed of 27,043 mi/h (43,522 km/h, 12.09 km/s). By the way, that is CRAZY fast. For comparison, to get that far Elon's Tesla Roadster took about 2 months if I recall correctly. At 9 hours after launch, the Parker Space Probe's current speed is about 12.4 km/s with respect to the center of the Earth. This is smaller than it was a bit over 8 hours ago when the third stage burn had completed. I calculate the vehicle's velocity was about 14.7 km/s just after third stage cutoff. The vehicle's current velocity (9 hours after launch) with respect to the center of the Sun is about 17.2 km/s. Note that this is a good deal smaller than is the ~30 km/s velocity of the Earth about the Sun. The primary purpose of this launch and of each of the Venus flybys is to reduce the vehicle's velocity with respect to the Sun. Reducing velocity with respect to the Sun at aphelion increases the vehicle's velocity with respect to the Sun at perihelion (closest approach to the Sun). The hoped-for 194 km/s velocity will result from drastically reducing velocity with respect to the Sun at Venus. The consequences of that reduction in aphelion velocity are (a) a drastic reduction in the perihelion distance, and (b) a drastic increase in perihelion velocity. Technically this answer doesn't specify what slows it down, but it does explain how it does. I've never done anything with orbital mechanics before today, but I got bored and read a few articles, linked below and made a scale model of the Parker solar probe's final orbit in my program I wrote from scratch! 0.043 AU is the distance from the sun it will end up at, this is the first oblong orbit that you see. 0.738 AU is the final distance it will be travelling after the 6 fly-bys of venus it makes. With each flyby of venus it lowers the lowest point of the orbit. When it starts at earth, it's going to be at approximately 1 AU away from the sun! The animation shows the difference between the starting orbit (Earth) and it's final one. Note: AU is arbitrary units in the graph, don't pay attention to the scaling for AU. If you look at the points on the graph, every single individual point is a specific unit of time. The only important thing to know is that the time it takes to go between any two dots is the same. Notice how the dots are super far apart closer to the sun! This means that it takes a the same amount of time to traverse more distance. This is also known simply as "going faster". At it's final orbit, closest to the sun, it will be going 700,000 km/h (wikipedia). The Earth revolves around the sun at about ~107200 km/h (wikipedia). The parker solar probe will be lowering one end of its orbit to a measly 7.3% of earth's lowest. This is done by using Venus' gravity to repeatedly slow (yes, slow!) the highest orbital point. By slowing the highest point, you stay there for a longer time and a smaller amount at the lowest. However, you travel the same amount of distance on both sides of the orbit! "Eccentric" is the word to describe "non-circular" orbits, or ones with a low point. Earth is about .01673 eccentric, that's basically nothing, we're a perfect circle. Parker solar probe will be approximately .846 eccentric by my calculations (probably off). Now, lastly, lets look at that velocity graph. Notice how the axis of the graph shrinks dramatically when we go from "Parker" to "Earth". 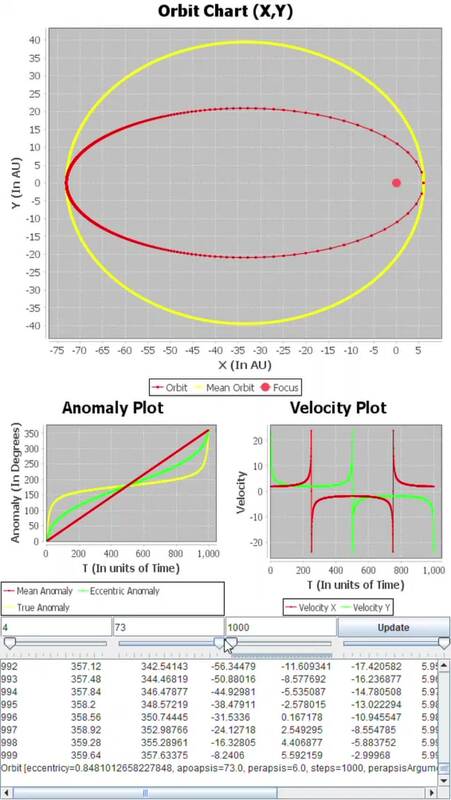 The maximum and minimum vector velocities shrink with a less "eccentric" orbit. With a perfectly circular orbit, you're not changing speed at all (simplified greatly). Look at how evenly the dots are spaced, all line segments are equal! This means they're equal in time (length) and speed (distance between two dots over time)! PS: Anybody please correct anything glaringly wrong with this answer, I want to learn too. Not the answer you're looking for? Browse other questions tagged nasa delta4-heavy parker-solar-probe or ask your own question.